Wrestling team meeting – For all students planning to wrestle next season Thursday, May 4th at 12:25 pm in Mr. Kane’s room 22-005. Seniors – All library books and materials are due by Tuesday, May 9th. If you need to keep a book longer for a class assignment, please contact Mrs. Keltner. Also, a reminder that all library fines need to be taken care of before graduation.Freshman-Juniors – All library books and materials are due by Monday, May 22nd. If you need to keep a book longer for a class assignment, please contact Mrs. Keltner. Perfect Attendance / Academic Award List (by Student #) – Please check the lists by May 4th posted outside of Student Services to see if you will receiving an Academic or Perfect Attendance award. The awards ceremony will take place on May 11 from 10-11 am during an all-school assembly. SOAP (Students of Active Prayer) will meet Thursday from 7:30-9:00 at 3220 Tipton Road. Everyone is welcome. Seniors & Parents/Guardians of Seniors – Important reminder from the MCSD Food and Nutrition Dept. – Letters were sent through the mail to seniors that had money left in their meal accounts . If the form is not returned by May 5th, we will assume that is acceptable to donate any leftover money to the MHS FN meal assistance fund to help other students. Thank you and congratulations! Art Extravaganza will take place on Thursday, May 4th from 7:00 am-7:00 pm in the MHS New Wing. Student’s artwork will be displayed and for sale. Snacks will also be sold. The public is welcome to attend. Proceeds go to the Art Club. FCA – We will meet on Wednesday over the lunch hour DOWNSTAIRS in room 11-037. There will be pizza! Key Club – Our end-of-the-year celebration is THIS Friday at 7:15 am in the library cafe. ALL members need to come for breakfast and some awesome awards! 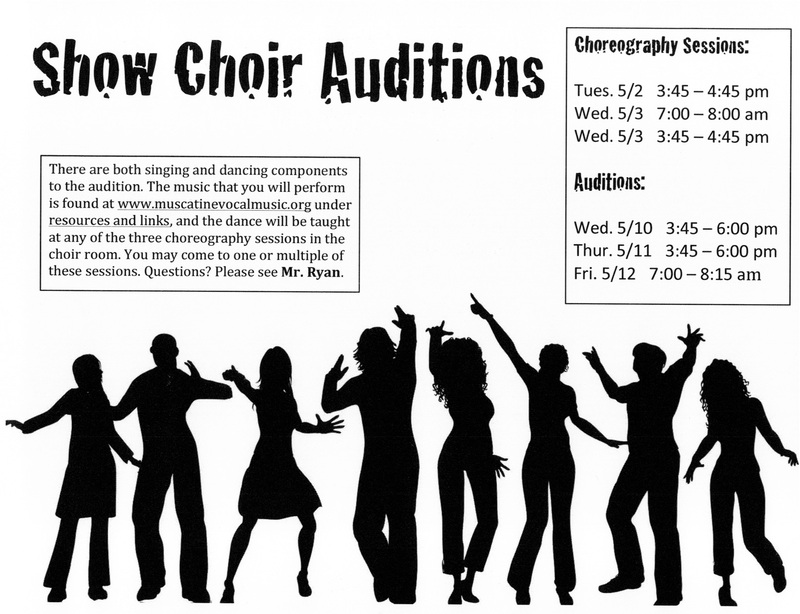 Show Choir Auditions – There are both singing and dancing components to the audition. The music that you will perform is found at www.muscatinevocalmusic.org under resources and links and the dance will be taught at any of the three choreography sessions in the choir room. You may come to one or all of the sessions. Questions? See Mr. Ryan. The Choreography Session scheduled for May 2nd has been rescheduled to Friday, May 5 from 3:45-4:45 pm. Muskie Girls’ Soccer game scheduled for Saturday at DM Lincoln has been moved to DM East HS Turf field. Varsity will now start at noon with JV to follow. Food Service News – There will be NO CHARGING of meals through the rest of the school year. Boys’ and Girls’ Soccer Players – Soccer Work Day has been rescheduled to Sunday, May 7th. Meet at the MHS Commons at 12:45 for your work assignments. There will be a meal afterward in the Commons. Clients are needed for Soccer Work Day – May 7th! Do you have yard work or other jobs that you need help with? — You can hire soccer athletes to do your work for you on Sunday, May 7th! Three (3) hours for $60! This is the one and only fundraiser the soccer players have this year. If interested in supporting the soccer players, please contact Kathy Berns at kathy.berns@yahoo.com or 260-4380. Attention all softball players! All those interested in playing high school softball, need to stop in and sign up in Coach Stoltzfus’ room 11-022 and sign up. Tryouts will be held Monday, May 8th, Tuesday, May 9th, and Wednesday, May 10th. Reminder you must have a physical and insurance form turned in before you can participate. If you have any questions, see Coach Stoltzfus. NEEDED….hosts for students from France THIS SUMMER! Language and Friendship is still looking for host families for visiting students from France. They will be here from mid-June to mid-July. For more information, visit languageandfriendship.com/hosting/ and use group ID: AG13911. You do NOT need to speak/study French; these students are looking for an immersion experience in English and the opportunity to learn about life in the USA. This is a wonderful opportunity to make an international friend. Are you interested in joining Student Council? Packets for next years’ Student Council organization can be picked up in attendance. Packets are due to Mrs. Fallon in room 21-022 by 3:30 pm on Friday, May 12th. If selected, you will be chosen for an interview; a time will be emailed to you at a later date. Student Council is open to incoming Freshman as well — packets are available at the main offices at Central and West. Current MHS Parents & Future MHS Parents – MHS Booster Club is looking for a few energetic & committed parents to join us for the 2017/2018 school year! Did you know that the MHS Booster Club represents and supports over 65 high school clubs, activities, and sports? We hold a meeting once a month at the high school & also help with concessions and other great school sponsored activities. It’s a great way to connect, meet new parents & get involved! 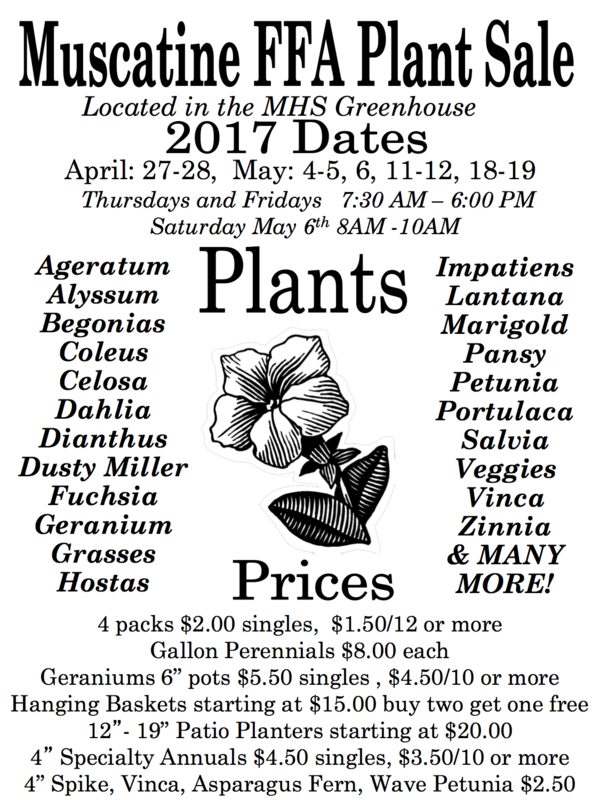 If interested in learning more you can contact MHS Booster parents; Carol Reynolds carol.reynolds@kentww.com or Joni Kerr jonikerr@machlink.com. We’re inviting potential new members to our May 10th meeting at 6:30 pm in the Muscatine High School Commons. Come see what we’re about! Perfect Attendance / Academic Award List (by Student #) – Please check the lists posted outside of Student Services to see if you will receiving an Academic or Perfect Attendance award. The awards ceremony will take place on May 11 from 10-11 am during an all-school assembly. The last day for Seniors to turn in silver cord hours is May 9th. If you need to see your hours please check with Mrs. Meeker or Ms. Ford in the Student Service Office. Lil’ Racer Car Club Volunteers – Volunteers are needed for Lil’ Racer Car Club at West Liberty Raceway in West Liberty, IA. Your entrance fee will be paid along with food and drink. Kids 0-14 years are registered in the club. We have a free table and do drawings for giveaways. There are 3 dates we need volunteers — April 29, May 27 and July 15. April 29 – Gunny Sack Races among other fun things with kids. May 27 – Candy Dash. (907 pounds of wrapped candy is scattered on the track and kids scramble for candy. July 15 – Ice Cream giveaway. 30 gallons of ice cream to scoop for all! Anyone interested, please contact Mitch Swinton (319-430-8734), Michael Pigsley (563-571-4780), or Rebecca Pigsley at pigsley65@gmail.com (563-272-1755).